HOUSTON  (January 17, 2012)  After several months in which home sales figures were skewed by the effects of the 2010 homebuyer tax credit, the Houston real estate market concluded 2011 solidly in the black. December marked the seventh straight month of increased home sales and the month contained a host of indicators suggesting a healthy start to the new year. Prices of single-family homes across Greater Houston for full-year 2011 were up slightly from 2010. The median price reached an all-time high for a December in Houston and months inventory hit its lowest level in two years. According to the latest monthly data compiled by the Houston Association of REALTORS® (HAR), December sales of single-family homes throughout the Houston market climbed 7.2 percent when compared to December 2010. Positive sales activity was recorded in every segment of the housing market except the luxury segmentthose homes priced from $500,000 and abovewhich was unchanged year-over-year. The average price of a single-family home was statistically flat at $219,791 compared to December 2010 while the December single-family home median pricethe figure at which half of the homes sold for more and half sold for lessrose 1.9 percent from one year earlier to $160,000. Foreclosure property sales reported in the Multiple Listing Service (MLS) increased 6.1 percent in December compared to December 2010. Foreclosures comprised 20.5 percent of all property sales, remaining consistent with the levels they maintained for much of 2011. December's median price of foreclosures held steady on a year-over-year basis at $82,550. December sales of all property types in Houston totaled 5,460, up 6.6 percent compared to December 2010. Total dollar volume for properties sold during the month increased 7.5 percent year-over-year to $1.16 billion. On an annualized basis, sales of all property types were up 4.3 percent compared to 2010 levels while total dollar volume rose 5.2 percent to $13 billion. "2011 ended on a very promising note," said Wayne A. Stroman, HAR chairman and President/CEO of Stroman Realty. ""We spent a good part of the year struggling to accurately gauge the market because we were comparing to accelerated sales in 2010 that resulted from the homebuyer tax credit. Once we distanced ourselves from that period, we saw clear indications of a healthy market with a balanced supply of housing inventory and strong pricingconditions that put Houston in an enviable position compared to many housing markets around the country. The key to sustaining that positive momentum in 2012 will be continued improvement in Houston's employment numbers." The Houston housing market concluded calendar year 2011 with noteworthy gains in sales volume along with strong pricing. Single-family home sales rose 4.0 percent for the year while sales of all property types increased 4.3 percent. On a year-to-date basis, the average price rose 0.9 percent to $213,723 while the median price ticked up 0.7 percent to $155,000. Total dollar volume for full-year 2011 climbed 5.2 percent to $13 billion compared to full-year 2010. The month of December brought Houston's overall housing market positive results when all listing categories are compared to December 2010. Sales of single-family homes as well as all property types rose along with total dollar volume. 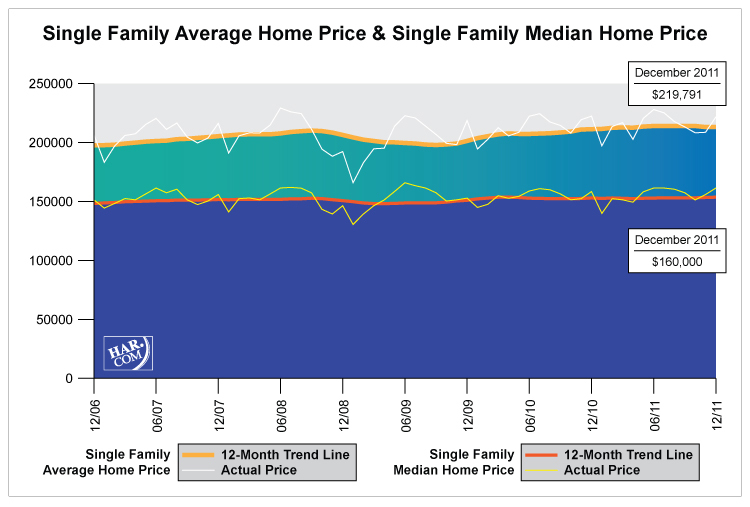 The median single-family price increased to its highest level for a December in Houston while the average price remained unchanged. Month-end pending sales for December totaled 2,907, up 3.0 percent from last year and a signal that a further increase in demand is likely when the January figures are tallied. The number of available properties, or active listings, at the end of December fell 14.1 percent compared to December 2010. This absorption of housing inventory accounted for a 20.2 percent decline in months inventory to the lowest level since December 20095.8 months versus 7.2 months in December 2010. That means it would take 5.8 months to sell all the single-family homes on the market based on sales activity over the past year. The figure is significantly better than the national inventory of single-family homes of 7.0 months reported by the National Association of REALTORS® (NAR). These indicators all continue to reflect a well-balanced real estate marketplace for Houston. December sales of single-family homes in Houston totaled 4,604, up 7.2 percent from December 2010. This marked the seventh consecutive increase of 2011. Broken out by segment, December sales of homes priced below $80,000 rose 10.2 percent; sales of homes in the $80,000-$150,000 range were up 3.1 percent; sales of homes between $150,000 and $250,000 climbed 7.3 percent; sales of homes ranging from $250,000-$500,000 advanced 12.8 percent; and sales of homes that make up the luxury marketpriced from $500,000 and upwere unchanged. At $219,791, the average price of single-family homes was statistically flat compared to last December. At $160,000, the median sales price for single-family homes reached a December high for Houston, rising 1.9 percent year-over-year. That compares to the national single-family median price of $164,100 reported by NAR. HAR also breaks out the sales performance of existing single-family homes throughout the Houston market. In December 2011, existing home sales totaled 3,755, a 7.7 percent increase from December 2010. The average sales price edged up 0.9 percent from last year to $203,253 and the median sales price was flat at $145,000. December sales of townhouses and condominiums rose 3.2 percent compared to one year earlier. In the greater Houston area, 388 units were sold last month versus 376 properties in December 2010. The average price climbed 2.5 percent to $173,675 from December 2010 to December 2011. The median price of a townhouse/condominium declined 4.9 percent to $131,750. The demand for Houston lease properties that prevailed throughout 2011 continued in December, though at a slower pace. Single-family home rentals rose 12.3 percent compared to one year earlier and year-over-year townhouse/condominium rentals ticked up 0.7 percent. As HAR reported throughout year, this demand was largely perceived as the result of hiring gains that have drawn consumers to Houston from around the U.S. These consumers may not be prepared or capable of purchasing a home for various reasons, among them tighter mortgage lending criteria. According to the Greater Houston Partnership, as of November 2011, the Houston metropolitan area gained 170,700 net new jobs, recovering 112 percent of the 152,800 jobs lost during the recession. 5.8 months inventory of single-family homes is the lowest level since December 2009 and compares favorably to the national average of 7.0 months.